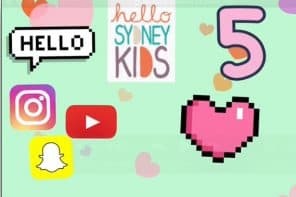 Check out all the best things to do in Newcastle when you visit with the family on this post by Sydney mother of two Fiona Kirsch. 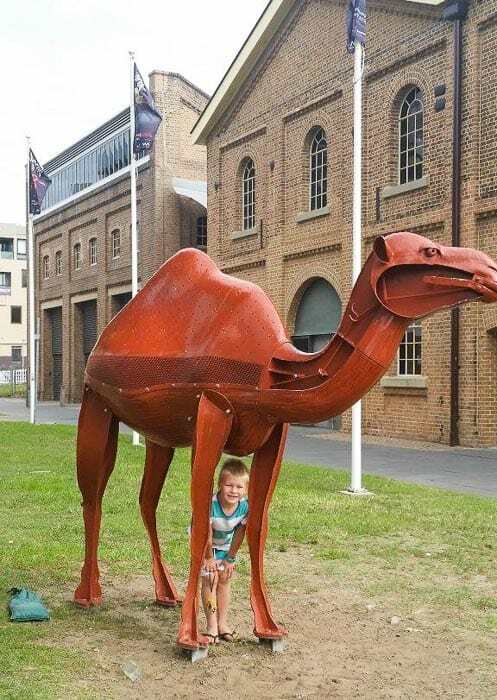 We recently took the kids and grandparents on a road trip to Newcastle and this proved to be a most memorable family visit. 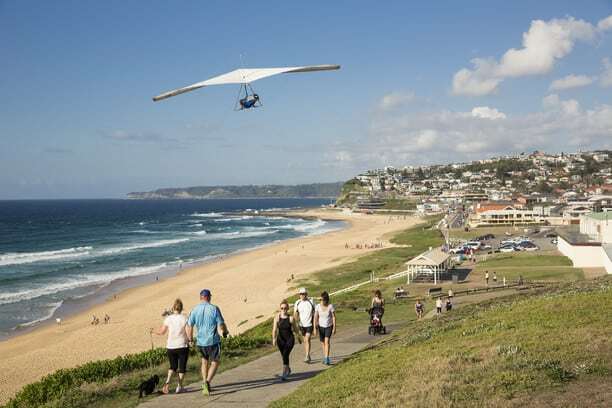 Newcastle is Australia’s seventh largest city and is approximately two hours from Sydney by car, an easy weekend away. Here are the top things to do in Newcastle with kids. We’ll be back again soon to explore Newcastle some more. NB This is a long article with maps, best viewed on your laptop or desktop. Opening Hours – 10am to 5pm Tuesdays to Sundays. (Open seven days a week in school holidays). Entry Fee – General Admission is free. The special exhibition incurs an entry fee. Amenities – The museum has toilet facilities and a café/shop. There are also plenty of seats around the museum for anyone who may need a short rest break. Parking – Road parking is hard to come by. We parked in a parking station nearby and it is a short 10 minute walk to the museum from there. 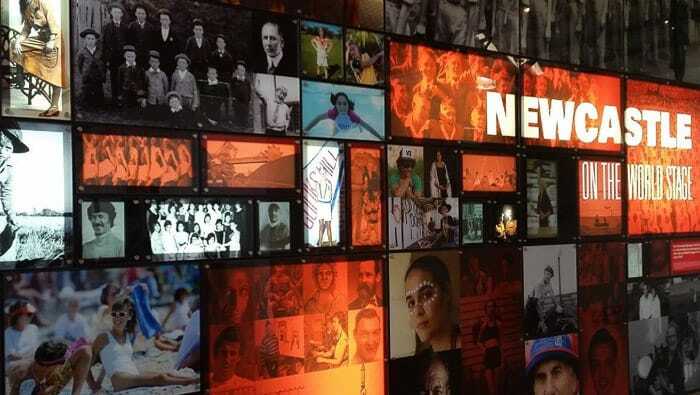 Activities – We all really enjoyed the museum. There is so much to see. 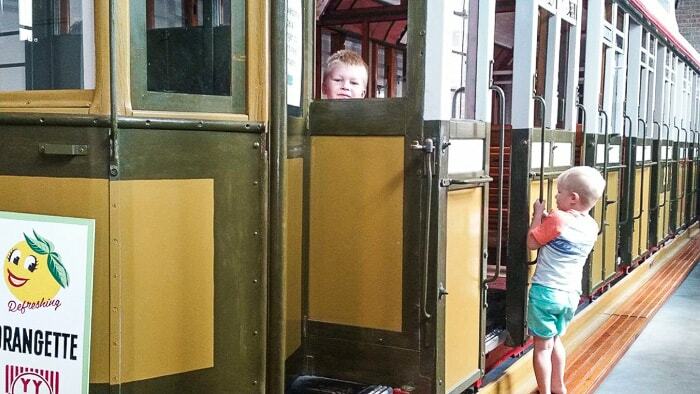 Learn about the history of the Hunter region, take a seat on an old tram, or wander through the rich coal mining history of the area. The kids especially loved the supernova science area, lots of hands on fun while learning. Meeting a friend at the Museum! Address: Carnley Avenue, Kotara, NSW 2289. Opening Hours – Wildlife exhibits open 10am to 5pm every day. Picnic area is open 7am to 7pm every day. Kiosk is open 10am to 3pm everyday excluding some public holidays. Entry Fee – Entry is free. The reptile show has a small fee. Amenities – There is a small kiosk on site selling refreshments and there are several toilet facilities. Parking – There is parking on Carnley Ave or if that is full then Richley Reserve also has parking at a maximum cost of $12 for the day, but access to the exhibits and kiosk is via Carnley Ave.
Activities – If your kids love nature like mine do, then Blackbutt Reserve is definitely worth a visit. It is divided up into two main parts. The Richley Reserve part (toilets, picnic area/bbqs, playground, two duck ponds, carpark), and the Carnley Ave part (kiosk, picnic area/bbqs, duck pond, wildlife exhibits, toilets, nature trails). It is a good idea to look on their website and plan your visit online. At the Carnley Ave entrance there are several wildlife exhibits including birds, mammals and reptiles. There is also a reptile show on every weekend and daily in school holidays, which is $3 per person. It is both fun and educational. There are also several well signposted nature walking trails which also outline the distance of the track. We did the tall trees walk which is very family friendly. Special Note – The Richley Reserve part, which has the playground, was undergoing refurbishment when we visited. 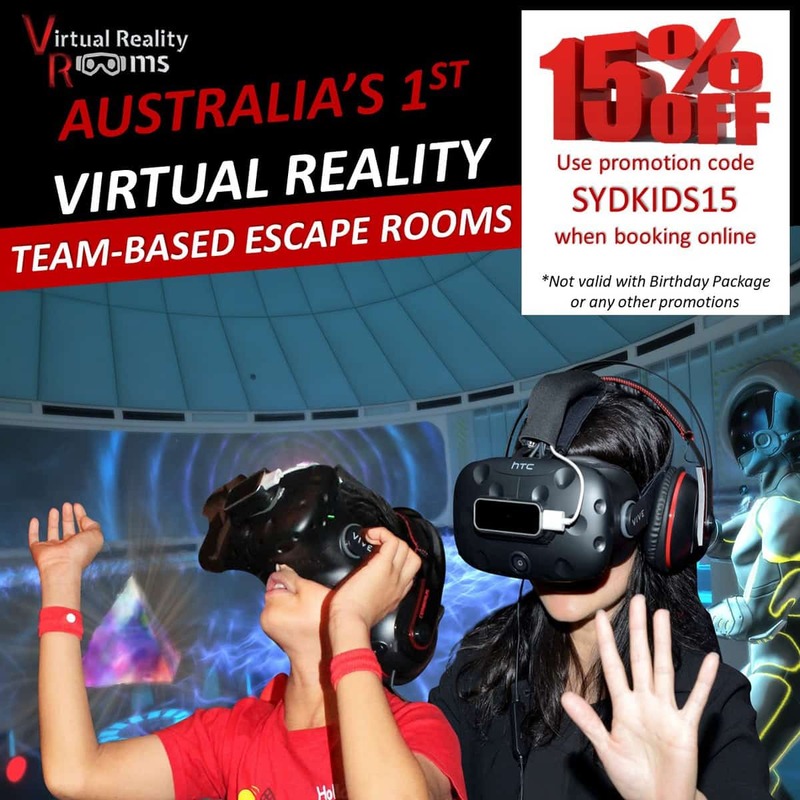 Check the Blackbutt website link above before making your travel plans. Amenities – No toilet facilities and no seating area. There are seats further along the memorial walk, but not at the lookout. The views from this lookout are amazing. 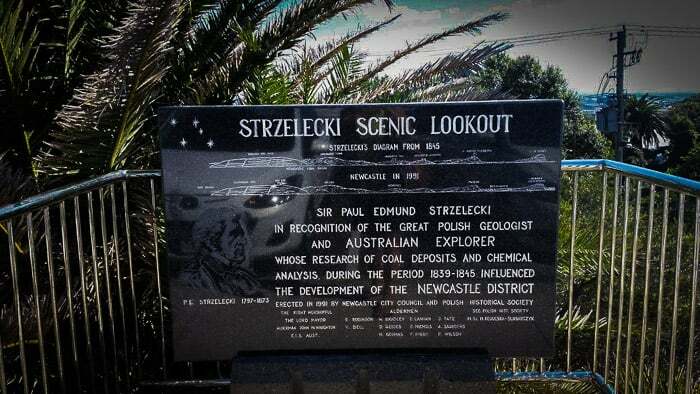 The lookout is named after Strzelecki, a Polish geologist whose research into coal deposits and chemical analysis contributed to shaping the Hunter region. Gaze out over the ocean or look out over the city of Newcastle. The day we visited there wasn’t a cloud in the sky, so the water was glistening. 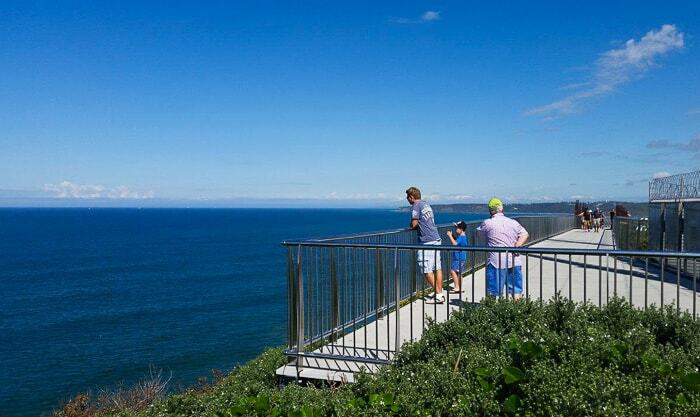 The lookout is the start of the Memorial Walk which was built to commemorate the centenary of the ANZAC. The Memorial walk is 450m. It also connects to the Bathers Way Coastal Walk by stairs if you want to continue your walk. For a pram/wheelchair friendly walk, start at the lookout and head to the Trip Point lookout where there is a seating area, then return. On our trip we came to the unanimous conclusion that Newcastle beaches are beautiful! 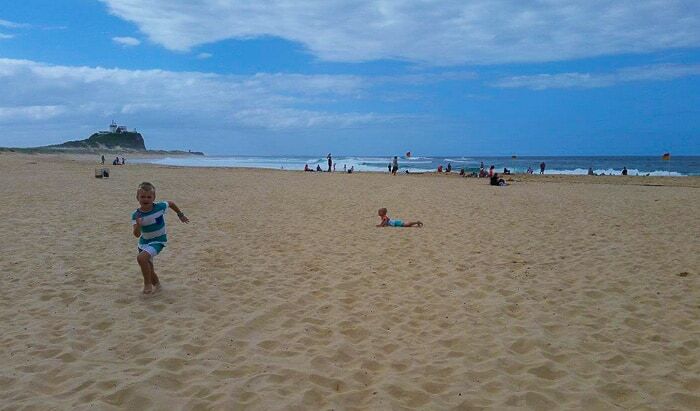 We visited Nobby’s Beach, Newcastle Beach, and Merewether Beach on our visit. All with crystal clear water and clean white sand. Swimming is a must but always between the flags! Lifeguards – Beach is lifeguard patrolled all year round. Café – There is a great place called ‘Swell Kiosk’ at Nobby’s Beach. Open 6:30am until late every day, all year round. The menu includes an extensive breakfast menu, burgers, wraps, salads, fish and chips, coffee, fresh smoothies, and milkshakes. All fresh and homemade. There are also cold drinks and ice-creams available. We stopped here for lunch and sampled the tempura fish and chips. The fish was fresh and perfectly cooked. Sit outside the kiosk and have one of the best views over the beach. There are plenty of picnic tables, some with shelter. Extra – Nobby’s Beach is also adjacent to dog-friendly Horseshoe Beach, so if you bring your furry friend on holiday, head over here. 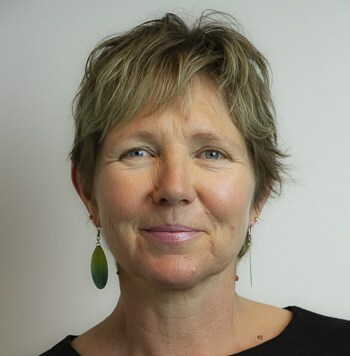 Toilets – There are male and female toilets/change rooms available. Lifeguards – Beach is lifeguard patrolled during swimming season. Café – Our hotel recommended a visit for breakfast to ‘The Kiosk’ at Newcastle beach. We were told it has the best coffee in town, and if you are lucky you might spy some dolphins. Unfortunately we didn’t see any dolphins on our visit, but the coffee definitely did not disappoint, it was perfect. The café is located in the tunnel walkway to the beach (Newcastle Beach Pavillion, 42 Shortland Esplanade, Newcastle). There are a few tables just for the café, but we chose one of the several picnic tables a few steps from the cafe. There was a resounding agreement that the bacon and egg roll was a winner! Extra – Newcastle Beach has beautiful historic ocean baths worth a visit. Café – A great spot for coffee with an ocean view at Merewether Beach is ‘Blue Door Kiosk’. Open 6am until 5pm everyday weather permitting (Corner Watkins St & John Parade, Merewether Beach). The kiosk has its own seating, again with the perfect view. We enjoyed coffee and homemade muffins here, but there are also some healthy acai bowls, toasted sandwiches, muesli, etc if you need something more substantial. Extra – Merewether Beach is the home to the historic Merewether Baths, which are the largest ocean baths in the Southern Hemisphere. If you are feeling energetic, walk past the baths to take a look at Glenrock Lagoon. 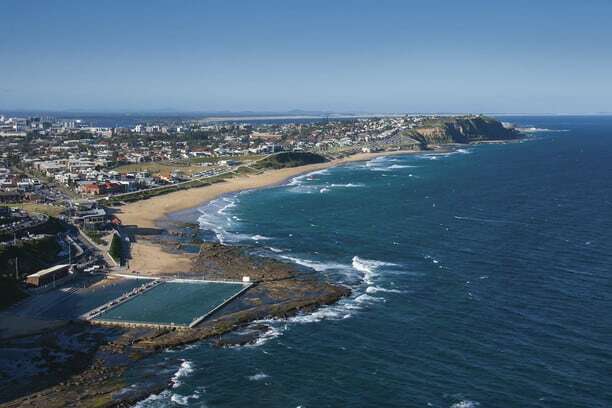 Merewether is also the host of Surfest, which is held here annually. Address: 1 Wetlands Place, Shortland, NSW, 2307. Amenities – There are toilets and a small kiosk style shop at the entrance with ice-creams and souvenirs. This is also where the entry tickets are purchased. Parking – There is a free carpark on site. Café – A cafe is located onsite at the wetlands. We ate lunch here and thoroughly enjoyed sitting out on the terrace overlooking the wetlands and wildlife. The food is fresh and delicious, with menu items such as burgers, cheese toasties, fresh sandwiches, salads, kids meals, a range of cakes, to name a few. It is also licensed. 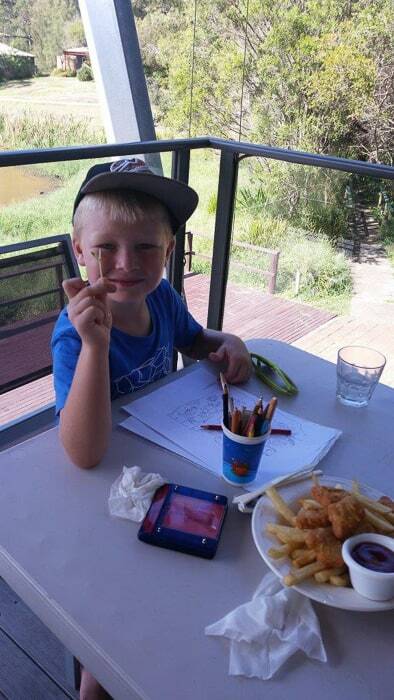 Activities – There is so much to see at the wetlands. When buying your tickets, you will be provided with a map of the wetlands which shows a 1 hour self-guided walk of the area. 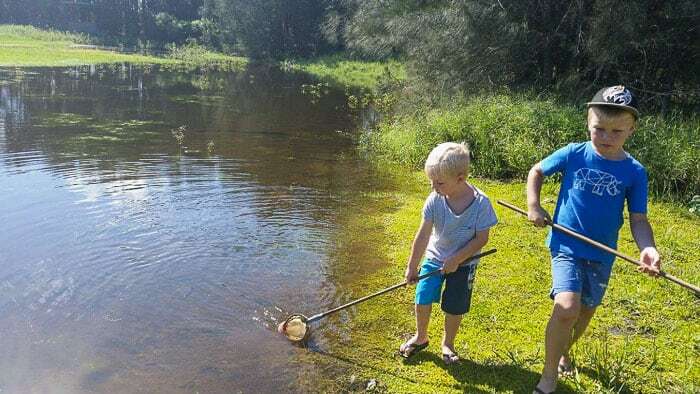 The kids can also pick up a net and insect chart and go dipnetting in the various ponds. 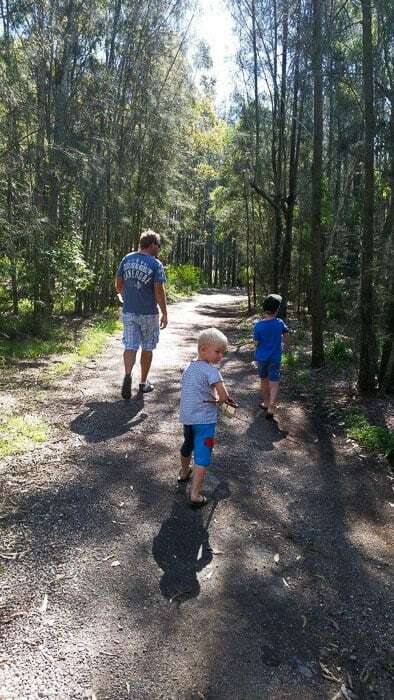 On the walk you can visit areas such as a bush tucker garden, reed marsh, egret tower, casuarina forest. There is also a fantastic playground with bbq’s and picnic area. The kids had a lot of fun spotting birds and ducks along the walk. Special Tip – At the door there is a basket of free suncream and insect repellant. On the day we visited mosquitoes were everywhere. Even though we covered ourselves in the repellant we still managed to attract a lot of mosquitoes. I would suggest wearing long pants and long sleeves if possible, as our shorts and tshirts were no match for the hungry mozzies. 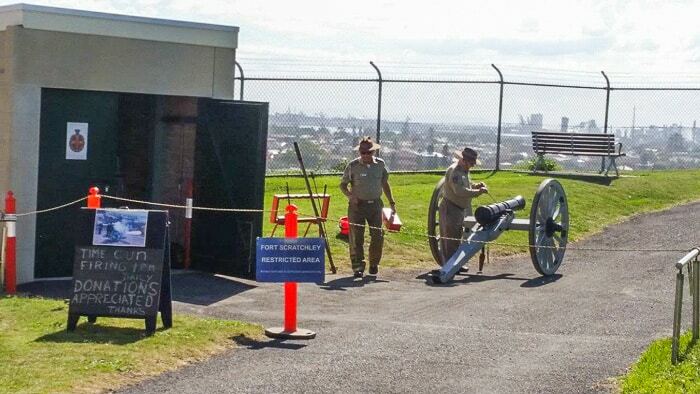 Address: Fort Scratchley Historic Site, Nobbys Road, Newcastle East NSW 2300. 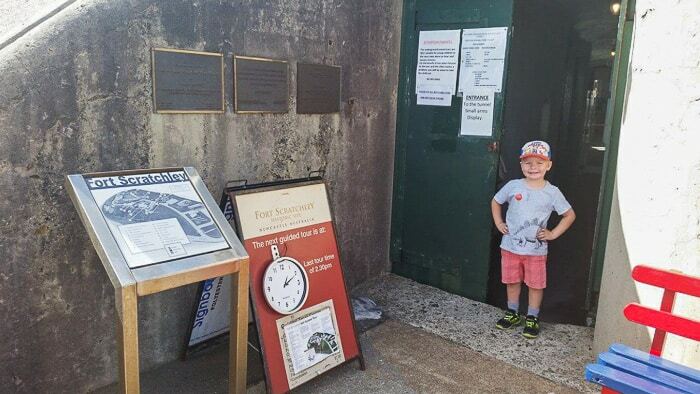 Parking – There is a small free carpark located at the entrance to the fort. Toilets – There are toilet facilities on site. Shop – There is a small shop, the ‘artillery store’, where tickets for the tours are purchased, along with drinks, ice-creams and souvenirs. 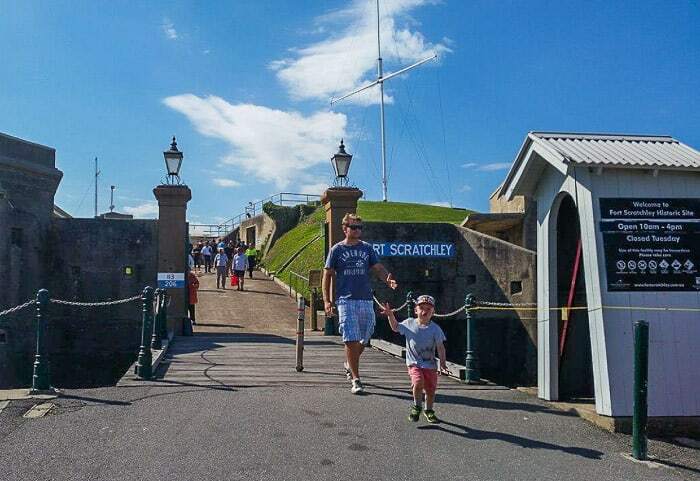 Before we visited Newcastle, we didn’t even know Fort Scratchley existed. It is a place rich in history, most noted for it’s important involvement in protecting Australia’s coastline during WWII. This place was a highlight of our trip for every age in our group. Grab a map from the shop and carry out a self-guided walk at your own leisure, looking at memorabilia, and walking to the top of the fort to have one of the best views of Newcastle. 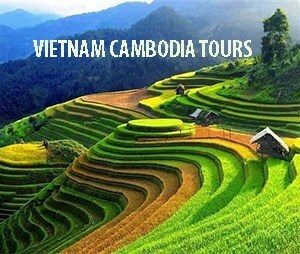 On our visit, we did the guided tour of the amazing tunnels. The tunnel tour takes about 60 mins, and is not suitable for prams/wheelchairs as there are a small set of stairs and some narrow hallways. The tunnels are primarily flat however, and there are plenty of chairs along the way to rest while the tour guide is talking. Both my 4 and 6 year old did the tour and loved it! The volunteers are very friendly and dedicated to sharing their knowledge of the site. They are more than willing to answer your questions. At 1pm everyday they firing of the gun is carried out. Definitely stay around for this, it was a highlight for the kids. Special Tip – Bring morning tea or lunch and sit on the grass at the top of the fort and have a picnic overlooking the beautiful ocean and Nobby’s Beach. Address – Wharf Road, Newcastle. The Queens Wharf Tower was built in 1988 as a reminder of the Queens visit to Newcastle. Walk the 180 steps to the top of the tower, for a view over the harbour and some of the city. 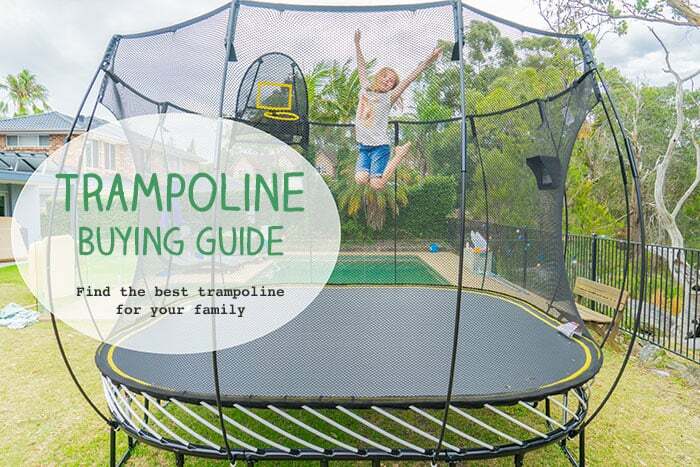 The kids were super keen to try this and loved every step. Climbing anything up high is always appealing to my two, so needless to say they didn’t care much for the view, just the thrill of the climb! Please Note – Unfortunately the tower is to be demolished late 2018, early 2019. Take a ferry ride across the harbour to Stockton. The ferry leaves daily from Newcastle’s Queens Wharf. Stockton is only 5 minutes away from Newcastle via ferry, but since my boys love boats, a ferry ride is always a favourite. Visit Stockton Beach which has the largest sand dunes in the Southern Hemisphere or once off the ferry, do the shipwreck walk like we did. The walk starts from the ferry wharf and is only 2km return. It is flat and easy to walk. 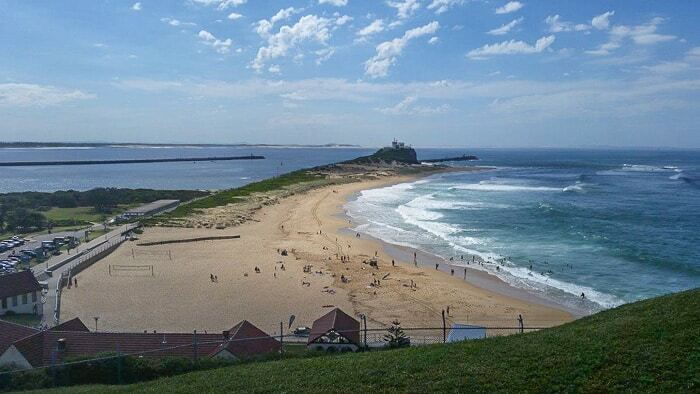 Have a view of Stockton beach or Newcastle as you walk out over the breakwall. It is called Shipwreck walk as many ships came into peril in the 19th and early 20th Century here, but now walking here, it feels quite peaceful looking out over the water. It is pram and wheelchair friendly. 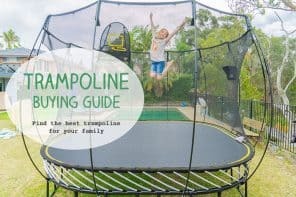 Here are just a couple of beautiful parks and playgrounds in Newcastle if you want some nice open space and play equipment for the kids to explore. King Edward Park is on York Drive, The Hill. It is a park with sensational ocean views and beautiful Norfolk pines. There is a playground, toilets, and lots of lawn to run around on. Foreshore Park is on 32 Wharf road. 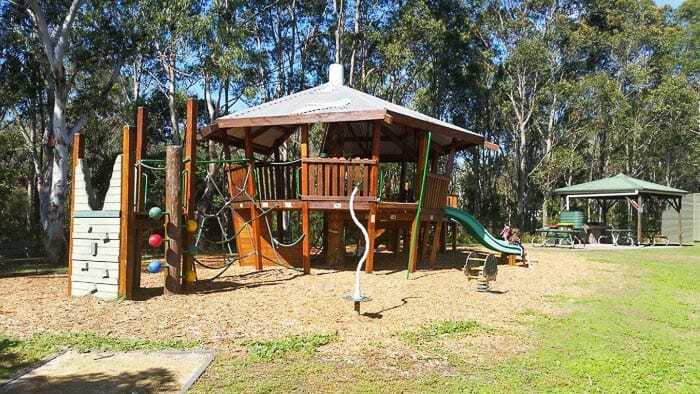 It has a playground, picnic tables, toilets, pond, walking paths and bbq facilities. Speers Park with its amazing playground is a bit further out of town, great to visit ont he way there or home. To enjoy the beautiful beaches and soak up the views, experience the Bathers Way coastal walk. The whole walk is 6km stretching from Nobby’s Beach Lighthouse to Merewether Beach. We did not walk the entire 6km, but walked it in small sections breaking it up for the little ones in our group. The views out over the ocean are spectacular. We played ‘Spot the boat’ while walking – there are so many to see on the horizon while walking along. 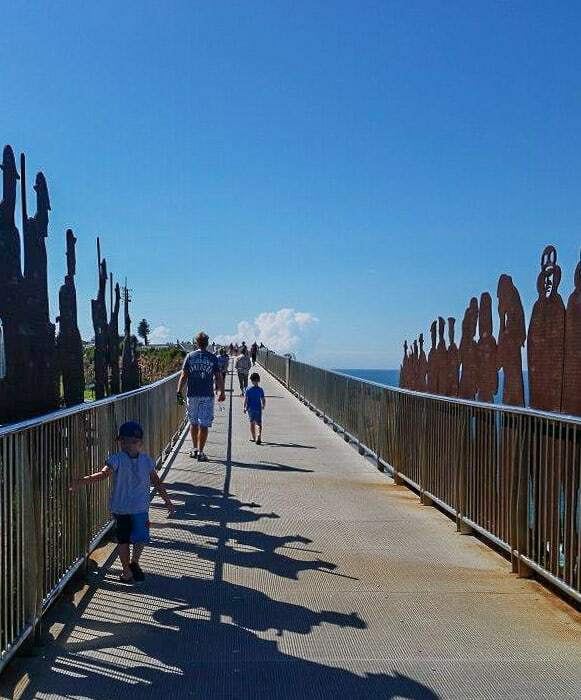 The Bathers Way walk connects to the Memorial Walk via stairs. To read more about Newcastle check out the Visit Newcastle website here. We chose Honeysuckle Drive for dinners, where there are many eateries to choose from, right on the Newcastle harbour foreshore. We enjoyed the midweek $12 Burger Night at The Squires Maiden. There is also a tasty $12 kids menu for the little ones and craft beers for the adults. When we dined it was school holidays and kid’s meals were free with any adult meal purchase so definitely worth a visit if you are there in school holidays. The food serves were generous and were served promptly even though it was a busy night. Colouring in for the kids is also available. Shop 1, South Boardwalk, Honeysuckle Drive, Newcastle. Another great restaurant on Honeysuckle Drive is Larnna Thai. Delicious food served very quickly, and very welcoming to kids. Restaurant seating, takeaway or delivery available. 188 Union Street, The Junction. We found a great café and gelato bar called The Hood Milk Bar at The Junction. It’s a super funky little place with very friendly staff. Breakfast, burgers, healthy salads and Kids meals available. The Hood Milk Bar is located not far from the Darby Street eateries and The Junction shopping centre, which has a Coles if you need necessities, but also very trendy boutique style stores worth a look. The Junction is only a short 5 minute drive from Merewether Beach and worth a visit. 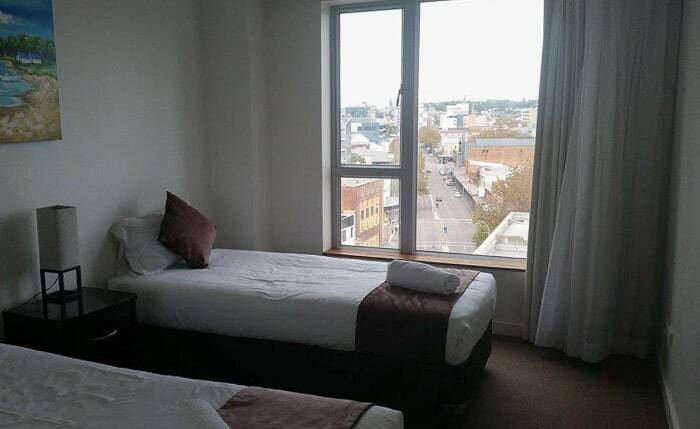 The hotel is 4.5 stars and is a perfect choice for families offering 1, 2, and 3 bedroom apartments, a heated outdoor pool, gym and restaurant. It also has secure undercover parking and is not far from the Honeysuckle harbour foreshore, cafes, restaurants etc. We thoroughly enjoyed our stay here. We had a party of six on our trip and had the three bedroom, two bathroom apartment. It was great to have a combined spacious living area where we could all be together, and a full kitchen available. We were on the 7th floor and the kids loved looking out over the city, especially the night time city lights. During our stay the restaurant was unfortunately closed, but it gave us the opportunity to venture out and try so many great eateries that Newcastle has to offer. Here’s a Booking.com dealfinder for Newcastle, a great way to research local bargains. 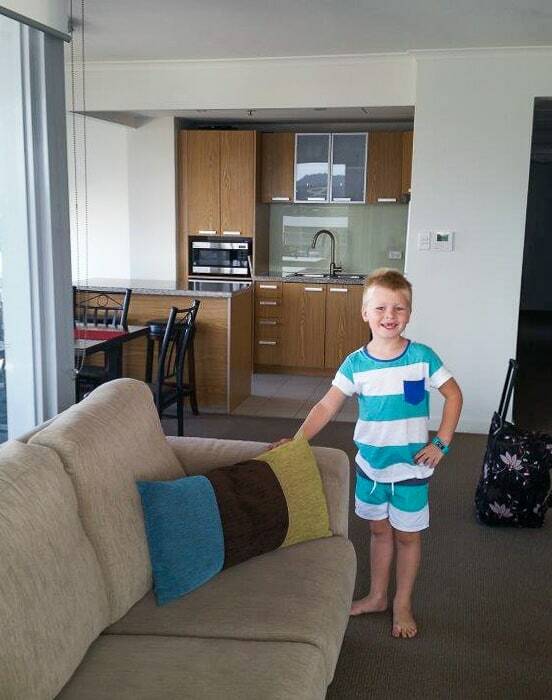 But Hello Sydney Kids does suggest always booking direct with the hotel, rather than through online booking agents. 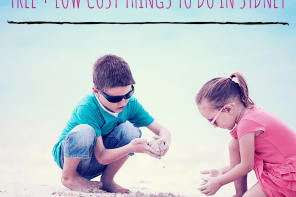 Can you add in your own top tips for Newcastle with kids? Here’s the map again for you to check out. I was in Newcastle in May (lucky me…. a long overdue girls weekend away so no kids) and found a little gem called The Grain Store. Historically it was a grain store, now it is a craft brew house. But it was fantastic for a Saturday afternoon…. live music, and as long as your kids are slightly older and controlable it would be fantastic for families…. they even had a pile of board games for kids. Thanks so much helen, that’s just the sort of info that really helps others. Nothing better than word of mouth. I would love to go next summer up to Newcastle for a swimming and beach and cafe adventure.